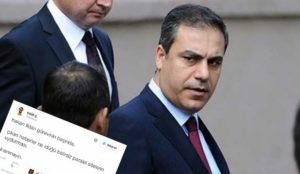 Hakan Fidan, Head of Turkey’s National Intelligence Organization (MİT) has briefed members of the US senate about the murder of Saudi journalist Jamal Khashoggi killed on Oct.02 in the Saudi consulate in Istanbul by a hit-man squad dispatched from Saudi Arabia; a key US ally in the Arab world. Fidan travelled to the US at the demand of the US lawmakers, Al Jazeera reported Thursday, adding that the behind closed-door briefing took place in the presence of CIA Director Gina Haspel. Haspel early this week briefed leaders of the House on the death of the dissident journalist and contributor to the Washington Post. Khashoggi, 59, was killed soon after he entered the Saudi consulate on Octo. 02 for some paperwork. Turkey identified a 15-man squad, which strangled the journalist who has emerged as a critic of Saudi Crown Prince Mohamed bin Salman (MbS). Turkish authorities said the men butchered Jamal Khashoggi soon after killing him. His body has not been found yet. Ankara believes the order for the killing came from the highest levels of the Saudi leadership but excluded King Salman from the plot. The Turkish MIT shared recordings of the killing with the CIA. According to the Washington Post and several media, the recordings identify MbS as the mastermind of the murder. Following Haspel’s briefing, several US senators said they have no doubt the Saudi heir to the throne is linked to the slaughtering. International pressure has been mounting on MbS since the killing of Jamal Khashoggi. Western powers have expressed their anger over the killing, with countries such as Germany and Norway suspending arms exports to Saudi Arabia and senators in the US questioning Washington’s strategic partnership with Riyadh. On Wednesday, a bipartisan group of Senators introduced a strongly-worded resolution holding the Saudi Crown Prince accountable for alleged atrocities committed during the Yemen war. Posted by KanelkaTagba on Dec 7 2018. Filed under Gulf News, Headlines. You can follow any responses to this entry through the RSS 2.0. Both comments and pings are currently closed.